Perhaps, these are some golden days for flying car founders. And one more name has made it to the list of successful flying car producers. Yes, we are talking about the renowned personality, Larry Page, co- founder of Google. Sometime back, he showed his faith in this fateful flying car project named, Kitty Hawk, which has now finally its maiden lift-off in California. This is just a dream come true for those who always wished to fly. 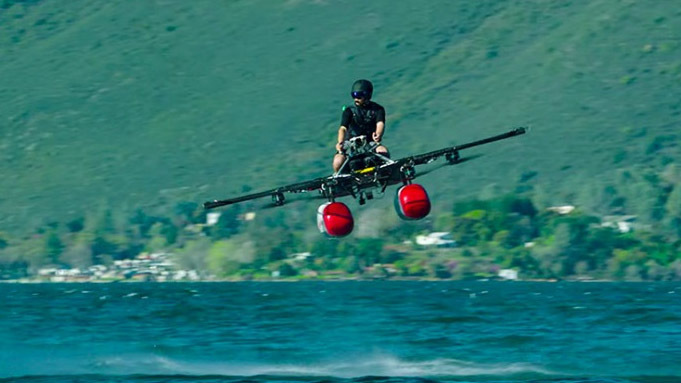 This super amazing ultra-light aero- vehicle can manage to take-off and land vertically on the ground just like a helicopter or a flying Jet Ski does. This electrical aircraft will be supported by strong eight rotors and would weigh around a 100 kg. This vehicle will be very feasible and easy to ride or fly or whatever we say since the control will be vested in the front handle bars. These handle bars replicate buttons and joy sticks like those of video game controllers and would be very simple to operate. The normal speed that it could fly at is up to 40 km/hr. The greatest news is one need not to have a pilot’s license to fly this amazing ride. For those, who might be wondering how to fly it? Well, it will be a matter of seconds to learn it and the next moment you will see yourself flying this fantastic vehicle. Legally, also one would not face any issues regarding its flying in the US geographical area. All you need to take care is that don’t take it some congested or huge traffic areas. Because, you might face any emergency and then there wouldn’t be any option to go for. But for now, the vehicle can only be flown over water at a height of 33 feet in the air. Now, coming to its affordability, the cost of machine is still not revealed, however, the start-up company is offering a $2,000 discount to anyone who wishes to make an early deposit of $100. Not only this, but the company is rewarding the first buyers exceptionally by giving them free test flights. The sale of the flyer is expected to begin by the end of this year.